2) Melt 3 tablespoons butter in a saucepan over low heat until it is foamy. 3) Add the garlic and saute, stirring, until it is fragrant but does not color, about 30 seconds. 4) Add the white wine and heavy cream, increase the heat to medium-high and reduce by half, about 8 minutes. 5) Add the remaining butter 1 piece at a time, whisking constantly, until the sauce is shiny, emulsified, and thick enough to coat the back of a spoon. Remove the saucepan from the heat. Add the chives, parsley and season with salt and pepper. Keep the sauce warm until ready to serve. 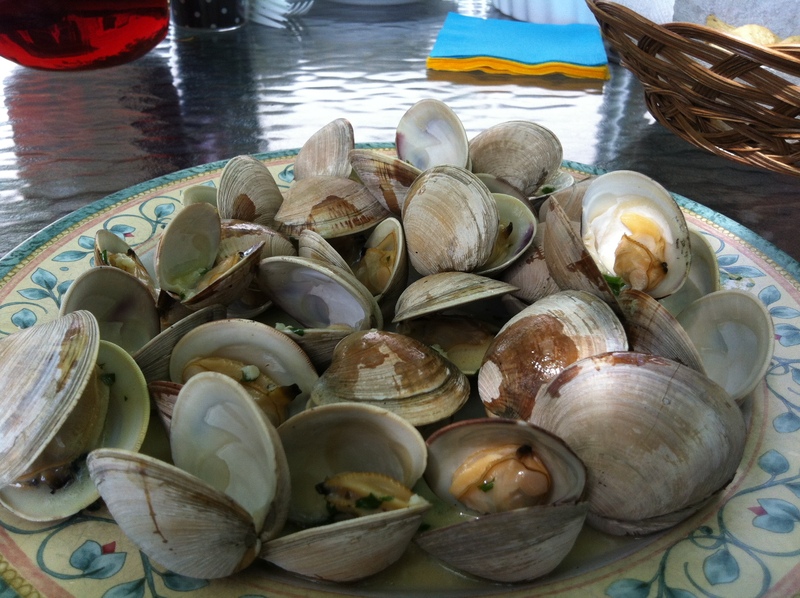 6) Set up the littleneck clams on the grill or grill basket. Cook the clams without turning them. As soon as the clams pop open, after 4-5 minutes, transfer them carefully with tongs to a platter (or plates) of rock salt. Use the tongs to pry off the top shells. Spoon 1 teaspoon sauce over each clam and serve immediately.